The Mill Creek Women's Club is a wonderful social and philanthropic club that meets on the 3rd Wednesday of each month, September through May at 10.30 am for a short meeting followed by a program and lunch at the Mill Creek Country Club. It is a place for women from the greater Mill Creek area to get together, meet new friends and give back to the community. The March 21st program featured a Mother/Daughter Fashion Show with Coldwater Creek supplying the fashions for the mothers and White House Black Market outfitting the daughters. The show was a big success with more than 100 members and guests in attendance. 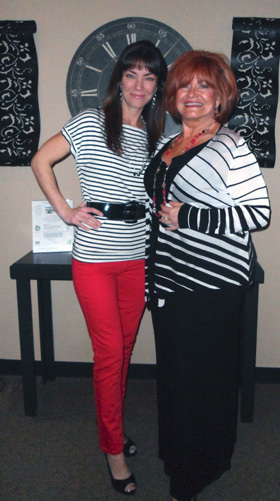 The photo shows Patricia Brady and her daughter Shannon Schlosser modeling their outfits. The Mill Creek Women's Club has over 35 volunteers each and every week supporting the YWCA Pathways for Women Working Wardrobe. This is a boutique style shopping experience for women in transition who are looking for an outfit for their next job interview. The Mill Creek Women's Club Auction in 2011 raised over $15,000 for the YWCA Pathways for Women. This program reaches over 1000 women each year in Snohomish County, helping them to help themselves and their families become independent. It provides emergency shelter as a safe haven for women and their children and helps families that have become homeless to rebuild their lives. The next Women's Club luncheon will be on April 18th when Jenny from My Garden will be demonstrating gardening tips and arrangements. Please go to www.millcreekwomensclub.com for more information.